Mmmm, pie. It was a success, in that the boy liked the pumpkin and I liked the apple (I liked the pumpkin, too, but I really liked the apple). 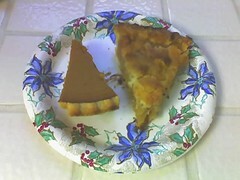 Other people liked the pie as well, so I don't think I'll get my pie-making card revoked any time soon. The apple pie recipe is an interesting one, in that it bakes inside a paper bag. It makes the kitchen smell like crap, as the bag smolders on the bottom, but it does its job as the apples get all steamed and it's just a good thing overall. A mess to clean up, but oh well. I got the recipe five years ago from PieRecipe.com, but it's no longer on the site. If anyone wants it, just holler. It's incredibly simple, and really good. Also, a commenter (the nice fellow who reviewed my plone book) noted that Flickr has a group recipe blog...so one day if I make something really REALLY good, and pretty, AND happen to take a photo, I may be so bold as to post there. But I think profgrrrl should go first.